What can grow as tall as a skyscraper and live for millennia? That would be the giant sequoia, one of the most impressive tree species on the planet. Here are 10 facts about America’s largest living residents. 1. THEY HAVE THE THICKEST BARK ON EARTH. The bark of a giant sequoia may be the thickest of any tree we know—on some specimens the outer layer of bark measures over two feet thick at the base. This formidable exterior provides the trees with super-powered protection. Their bark also doesn’t contain any flammable pitch or resin, and if it were to ignite in a forest fire, the girth would slow flames from reaching the wood inside. 2. THEY DEPEND ON FOREST FIRES TO REGENERATE. Giant sequoias not only can survive forest fires, they thrive on them. When a sequoia grove catches fire, the heat opens up cones on the forest floor and releases the seeds inside. The blaze eats up any brush or deadwood that’s accumulated on the ground while leaving behind nutrient-rich ash in which the saplings can flourish. Forest rangers only became aware of the renewing benefits of fire a few decades ago. Prior to that, they would extinguish every flame they saw then wonder why no new sequoias were growing. Today rangers will intentionally set controlled burns to simulate the natural process. 3. THEY'RE RESISTANT TO DISEASE. Fire isn’t the only threat a giant sequoia is built to endure. Thanks to a high concentration of tannin, an insoluble chemical compound found in many coniferous trees, the trees are immune to most diseases. Not only does the astringent substance protect the sequoia from fungus, it also safeguards it from insect attacks. 4. THESE BIG TREES COME FROM SMALL SEEDS. The largest tree on Earth is born from a very tiny seed—91,000 of them add up to a single pound. Giant sequoias can’t sprout from roots or stumps like the coast redwood can, which means all the reproductive responsibilities fall to the seeds. Animals like squirrels, chickarees, and beetles are instrumental in cracking open sequoia cones and dispersing the contents. But for a seed to germinate it needs to make direct contact with bare, mineral soil (which is why fires are so vital). Giant sequoias release 300,000 to 400,000 seeds per year, so there are plenty of chances for the conditions to be just right. 5. THEY CAN LIVE TO BE REALLY, REALLY OLD. Before the first Olympics were held or the first pyramids were built in Mexico, the oldest living sequoia had already started to grow. The President, located in California's Prairie Creek Redwoods State Park, is estimated to be about 3200 years old. Despite its old age, the giant hasn’t slowed down at all. The annual wood production of older sequoias is actually greater than that of younger specimens. And while three millennia may be more time than you can wrap your head around, it isn’t a record-breaker: Bristlecone pines and Alerce trees both live to be older than giant sequoias. 6. THEY PRODUCED THE LARGEST LIVING ORGANISM ON EARTH (MAYBE). 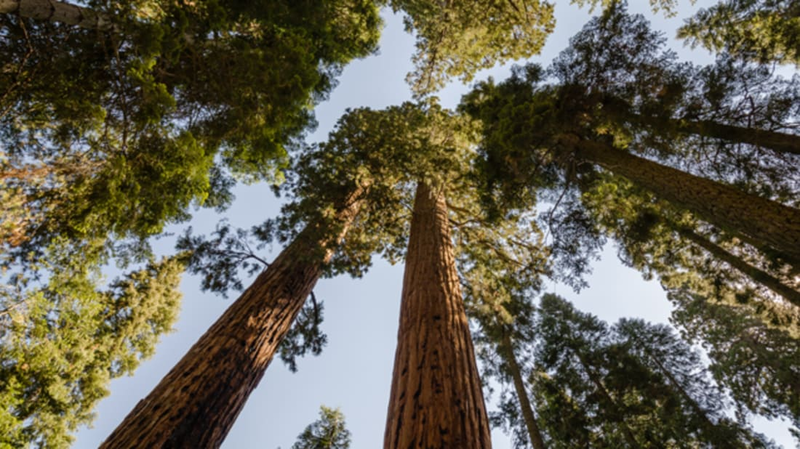 Giant sequoias don’t lay claim to the tallest tree on Earth (that distinction belongs to coast redwoods, a close relative), but they do have the largest tree by volume. General Sherman in California’s Sequoia National Park boasts a mass of 52,500 cubic feet, which is over half the volume of an Olympic-sized swimming pool. The trunk alone weighs about 1400 tons or the equivalent of 15 blue whales. According to the National Park Service, all that lumber could be used to build 120 average-sized homes. As for whether or not General Sherman is the largest living thing on Earth, it depends on who you're asking. Under some definitions, the title belongs to the Great Barrier Reef or a 100-acre grove of Aspens in Utah that share a single root system. But if you limit the pool to single-trunked trees, the giant sequoia takes the cake. 7. THE DEATH OF TWO SEQUOIAS LED TO THE BIRTH OF THE NATIONAL PARK SERVICE. European-Americans first stumbled upon giant sequoias in the foothills of the Sierra Nevada in 1853, according to The Guardian. The initial instinct of gold miners in the area was to chop one of the trees down, an act that took three weeks to complete. Once felled, a section of bark from “Mammoth Tree” was shipped to San Francisco for an exhibition. The bark was propped up to house a piano for performances before eventually ending up on Broadway in New York City. The following year, a second tree, dubbed “Mother of the Forest,” was toppled and its bark sent to the Crystal Palace in London. Meanwhile, the stump that Mammoth Tree left behind was used as a dance floor by flocks of tourists. Once passed, that bill opened the door for the establishment of the first-ever national park at Yellowstone, and ultimately, America’s National Park Service. 8. THEODORE ROOSEVELT WAS A FAN. 9. ONE OF THE MOST FAMOUS GIANT SEQUOIAS RECENTLY COLLAPSED. Up until January 2017, one of the most intimate ways to experience a giant sequoia was by passing through one. Pioneer Cabin Tree in Calaveras Big Trees State Park had featured a tunnel big enough for a car to pass through since the late 19th century. The owner of the Calaveras North Grove carved out the opening to compete with a similar tree-tunnel attraction in Yosemite. For decades tourists were allowed to drive straight through it, but in recent years the only way to enter the tunnel was on foot. The tree fell to the ground and splintered apart on impact on January 8 during a severe rainstorm. Apparently the loss wasn't a total shock: The tree had been leaning for years, and prior to receiving its hole it had sustained a fire scar that kept the top from growing. 10. YOU CAN FIND THEM OUTSIDE OF CALIFORNIA. At one point giant sequoias flourished throughout the Northern Hemisphere, but their distribution has since become much more limited. Most sequoia trees are concentrated in 77 groves located throughout Northern California. A handful of specimens can be found elsewhere, thanks in part to horticultural trends of the 19th century. Exotic gardens were all the rage in England by the time the first sequoia was discovered by European-Americans in the 1850s. Today some of the oldest sequoias growing outside their natural range are housed in British castle gardens and arboretums. They can be spotted in other European countries as well: In France, the trees were once planted along entire streets.